The Aztec Empire was ruled by an absolute monarchy where the king was considered the supreme political and religious leader. The Aztec king, of course, ruled with the help of the nobility which consisted of the landed class, the priests, and the warriors. Like other kings, Aztec kings also had certain myths associated with them which traced their lineage to the Aztec gods. These myths provided legitimacy to the rule of the kings and consolidated their powers. They also claimed to be the descendants of the Toltec kings who were thought to have been semi-divine beings and pioneers of the Mesoamerican culture. The Aztec Empire was formally established in 1428 but the city-state existed much before that. The history of Aztec kings is thought to have started with the first ruler, Acamapichtli, who was the founder of the Aztec imperial dynasty. He became the king of the Aztecs in 1375 and ruled until 1394. The Aztec king whose reign saw the laying of Aztec Empire’s foundations was Itzcoatl who ruled the Aztecs from 1427 to 1440. During this time, the Mexica people defeated their former allies the Tepanecs, thus starting the era of the Aztec Empire. The last Aztec king, before the Spanish conquistadors took control of the empire, was Cuauhtemoc who became king in 1521. Aztec King Acamapichtli (Reigned-1376–95) – The history of Aztec kings is thought to have started with the first ruler, Acamapichtli, who was the founder of the Aztec imperial dynasty. Aztec society was a class society and class distinctions were seriously maintained. Thus there was considerable difference between the dress of the common people and that of the ruling class. 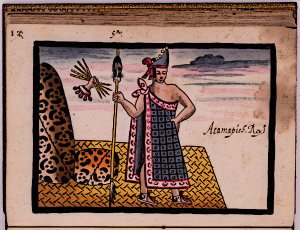 The common costume of the Aztec king consisted of a long rob, usually of while colour, which could either be worn on one shoulder or used as a cape. The cape, used along with a loincloth of the same colour, was called “xiuhtilmatli” and could be in any colour. Kings also used various headdresses with feathers of quetzal which was a bird with blue-green feathers about three feet in length. Aztec kings ruled an empire and thus enjoyed considerable wealth and privilege. The residence of the king was nothing short of a palace as it consisted of high walls, patios and courtyards, innumerable rooms, and several baths. The residence was built on a raised platform and covered as much area as 50,000 square meters. Beautiful stones and adobe would be used in the construction of the palace. Sometimes, the Aztec rulers even had more than once palace. The Aztec kings were also quite wealthy as they regularly received tribute from the subjugated city-states. 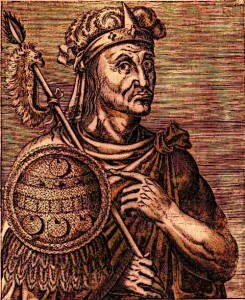 Aztec King Motzumel II ruled the Aztec empire after Motzumel I and reigned during the attack on Tenochtitlan by the Spanish conquester Hernan Cortes. The first known Aztec king was Acamapichtli who ruled the Aztecs from 1376 to 1395. He was succeeded by his son Huitzilihuitl who remained the king from 1396 to 1417. After him, his son Chimalpopoca became the Aztec king and ruled the kingdom from 1417 to 1427. In 1428, the Aztec Empire was established and the first Aztec king who ruled this empire was Itzcoatl who remained the emperor from 1427 to 1440. Subsequent Aztec kings include Moctezuma I who ruled from 1440 to 1469, Axayacatl who ruled from 1469 to 1481, and others. The last emperor of free Aztec Empire was Cuauhtémoc who became emperor in 1421 and was eventually captured and executed by the Spanish conquistador, Hernan Cotes. Aztec kings enjoyed virtually unlimited powers over their subjects. They were not only politically supreme but were also religious figureheads and were considered descendants of the gods. The Aztec kings received tribute from the subjugated city-states and within the capital city of Aztec they had a grand palace where they lived. The king was known as Huey Tlatoani which means “Great Speaker”. The king decided when to go on wars and what amount of tribute the subjugated city-states were to pay. 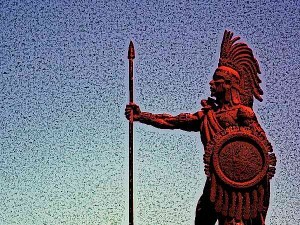 Aztec King Cuauhtémoc was the final Aztec King – Cuauhtemoc (ca. 1496-1525) was the last of the Aztec rulers and a heroic defender of his empire against the Spanish conquistadors. The exact routine of the daily lives of Aztecs kings is unclear because of the paucity of written accounts. But most part of their daily life was taken by running the affairs of the state and worshipping the gods. When the Aztec king first assumed the throne, he would spend a few days fasting and worshipping gods. His daily responsibilities included deciding important matters related to defense, trade, and law. Worshipping gods was also a daily ritual of Aztec kings. Religion was very important to Aztec kings since it provided legitimacy to their rule. Aztec kings were considered descendants of gods and thus their rule was thought to possess divine sanction. The kings, thus, invested heavily in the construction of religious monuments and the religious festivals. Through warfare, the Aztec kings also made sure that war captives for human sacrifices were always available. Religion was, thus, central to the rule of Aztec emperors and they considered it very important. There was a close relationship between Aztec kings and their gods as it was considered that the Aztec kings were direct descendants of the gods. It was believed that the divine sanction had given Aztec kings supernatural powers. Due to this reason, various legends and myths were associated with the Aztec kings. For instance, it was said about Xihuitlpopoca that he was conceived without human intervention just like the gods Quetzalcoatl and Huitzilopochtli. Similarly, it was said that Nezahualpilli as a child could change himself into an eagle. This variety of legends was associated with the kings because of their close association with the Aztec gods. The last king of the independent Aztec Empire was Cuauhtémoc who ascended to the throne on the eve of Spanish invasion in 1421. His initial contact with the Spanish conquistador Hernan Cotes was not very hostile but later on differences arose between them and he was captured by the Spaniards. Eventually, the king was executed in 1425 and this brought about an end of independent Aztec Empire. Aztec society was a class society where social distinctions were strictly maintained. At the top of this hierarchy was the Aztec king or emperor who was the person of supreme importance in the Aztec society. The Aztecs king was thought to have been descended from gods and thus he enjoyed ultimate political and religious authority. The Aztec king decided when it was time to go to war and organised other affairs of the state from his magnificent palace. Religion was very important to Aztec kings since it provided legitimacy to their rule and Aztec kings heavily invested in building grand religious monuments and participated in religious rituals.